You Are Not My Type! “Ask yourself the question: Why did Hashem disperse the Jewish people? Ans: It was because there was no love for Yeshua, unbiased hatred, not for other Jews but for your Messiah. “He was hated without cause”. 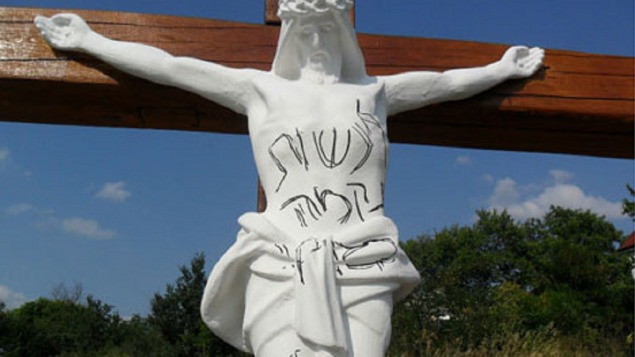 “To exact vengeance on the gentiles,” reads the message, which was scrawled across the torso of a figure of Jesus. Torso recently erected in view of the grave of Rabbi Nachman of Breslov. Now here are number of points to be noted with respect to the above question and answer. The first point is the almost universal attitude of most missionaries to ask questions which ignore the actual context, content and testimony of the Jewish scriptures. Like as if the scriptures never really played themselves out in the lives of a real people/ nation. King David, a real King being the author who relates his experience of being hated without cause is just lost on those missionary types. A scripture never really applying to a real people is because the NT compilers themselves decide what part of the ‘Old’ Testament Yeshua is quoting as a ‘fulfillment’. In Christian theological terms ‘fulfillment’ is in the sense that the ‘fullest’ possible meaning may only derived in the life and teachings of Yeshua. Here is another point; a subtle way of you accepting the idea of ‘typology’. Typology in Christian theology and Biblical exegesis is a doctrine or theory concerning the predictive relationship of the Old Testament to the New Testament. Events, persons or statements in the Old Testament are seen as types pre-figuring or superseded by antitypes, events or aspects of Yeshua or his revelation described in the New Testament. The problem of course is that ‘typology’ is completely a NT invention; you simply cannot find such an idea of ‘typology’ in the Jewish Scriptures however. Without Jesus/ Yeshua fulfilling those Jewish scriptures Jews and Judaism are irrelevant! Not a peep from those nations about the Jews not accepting a messiah or Jesus/ Yeshua! 4 For the children of Israel shall sit solitary many days without king, and without prince, and without sacrifice, and without pillar, and without ephod or teraphim. So much for a once and for all Sacrifice and Jesus/ Yeshua your not my type either!! Psalm 35:19 Do not let those gloat over me who are my enemies without cause; do not let those who hate me without reason maliciously wink the eye. Baal, a Canaanite and Phoenician god of fertility and rain Jdg 2:10-13 Baal, meaning “lord”, was pictured standing on a bull, a popular symbol of fertility and strength. Baal was associated with Asherah and Ashtoreth, goddesses of fertility. Molech, the chief deity of Ammon 1Ki 11:4-5 See also Lev 18:21 The practice of sacrificing children to Molech was common in Phoenicia and the region; Lev 20:2-5; 1Ki 11:7,33; 2Ki 23:10 Josiah destroyed the area where the altars for child sacrifice were located; 2Ki 23:13; Isa 57:9; Jer 32:35; Jer 49:1,3; Zep 1:5.